Nothing screams grill season like a hot dog. 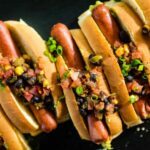 Take things up a notch with this island influenced pineapple salsa and guacamole char-grilled hot dog recipe! Build a charcoal fire for indirect heat in your kettle grill. Clean and oil your grill grate. Cover, once the coals are arranged and let pre-heat. Grill pineapple slices until grill marks appear on both sides. Remove from grill and set aside. Grill the avocado, flesh side down a few minutes for grill marks and then flip and cook another 3 to 4 minutes until soft. Set aside to cool. Meanwhile, combine the corn, black beans, tomatoes, red onion, jalapeno, scallions, cilantro, juice from 2 limes in a bowl. Add the chopped pineapple and toss to combine. Set aside. Scoop out the avocado into a bowl and add the minced red pepper, onion, cumin, salt, pepper, cayenne, sour cream, and the juice from 2 limes. Mash together with a fork, folding and mixing to your linking. Set aside. Salsa and guac can be stored, covered in air tight containers in fridge for up to 6 hours. For guacamole, make sure plastic wrap is touching the surface to avoid discoloration due to oxidization. When ready to serve, cook the hot dogs until desired char on the grill. Scoop guacamole into the buns and spread evenly. Place a cooked hot dog in each and top with a healthy scoop of the pineapple salsa. Serve fresh.